The new Citroen C5 Aircross is now on-sale in Ireland, with prices starting from €26,495. Available in four trim levels ‘Start’, ‘Touch’, ‘Feel’ and ‘Flair’, the new C5 Aircross is now available to test drive at Citroen dealerships nationwide. 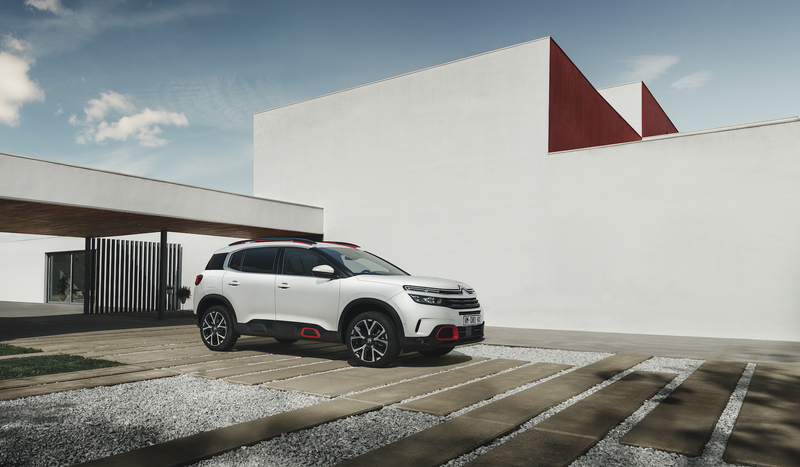 All versions of the new C5 Aircross SUV in Ireland are equipped with Citroen’s Progressive Hydraulic Cushions suspension which deliver peerless comfort and the ‘magic carpet ride’ effect for extra occupant comfort. All models come equipped with three individual sliding, folding and reclining rear seats for extra practicality and include boast best-in-class boot space of 580-litres to 720-litres. ConnectedCAM, a factory fitted dashboard camera from Citroen is also standard across the range. These features ensure optimal levels of comfort, practicality and safety across the entire range. Measuring 4.5m long, 1.7m high and 2.1m wide, the Aircross has a broad and imposing front end and is paired with a two-tier light signature and an assertively designed grille. The upper light units, which comprise of the daytime running lights and indicators, extend out from the iconic chevrons on the front and stretch across the entire width of the vehicle for a modern and expressive look. The body features wheel arches extensions and lower body panels with a classic SUV look, Airbump panels are also available with personalised coloured inserts along with front, side and roof bars for extra modernity and personality. An integrated 16 GB memory card is used to store photos and videos while footage from a collision will automatically save to the device. The new C5 Aircross is the only car on sale in Ireland to offer such technology as standard across the range. 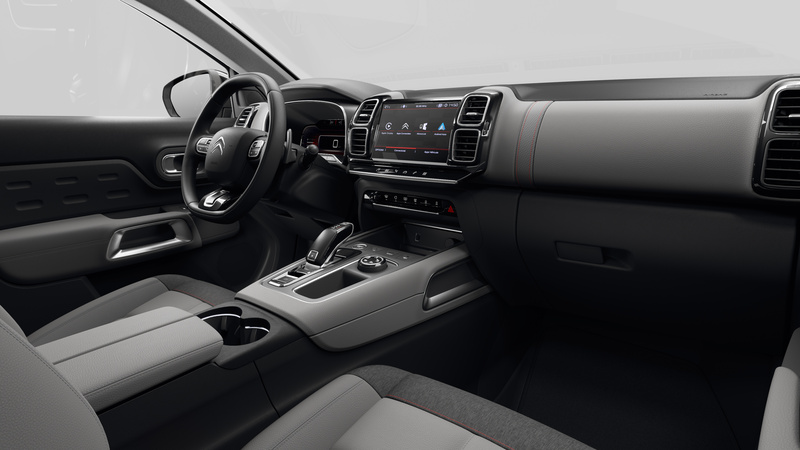 The entry Start trim level includes features such as an eight inch touchscreen display, cruise control, active safety brake and air conditioning. The Touch edition adds items such as 17 inch alloys, rear parking sensors, folding mirrors, android auto & apple car play while the Feel model benefits from 18 inch alloys, front parking sensor, privacy glass, wireless phone charging and active blind spot detection. The Flair is the top specification level and includes additional items such as 19 inch alloys, Citroen connect navigation, keyless entry and keyless start, a Panoramic Sunroof with interior LED ambient lighting and various driver assistance systems such as park assist, active lane departure warning and adaptive cruise control. Highway driver assist is also standard on Flair models coupled with the EAT8 automatic transmission, this feature combines adaptive cruise control, active lane departure warning and a stop and go feature to manage driving semi-autonomously in specific driving conditions. The C5 Aircross comes with a selection of two petrol and two diesel engines. The popular PureTech petrol offer, comprises of a 1.2litre 130hp engine paired with a six-speed manual transmission and a 1.6litre 180hp unit which comes with the choice of a six-speed manual or eight-speed automatic transmission. The Blue HDI diesel offers a 1.5litre 130hp engine with the choice of a six-speed manual or eight-speed automatic transmission and a 2.0litre 180hp unit which comes as standard with an eight-speed automatic transmission.